Fair play to the Spaniards. Last week, they got fined by the EU because they broke the rules on fiscal deficits. There's nothing that upsets Brussels more than someone breaking the rules on fiscal deficits. They've got whole buildings full of people who do nothing all day except check that everyone is keeping to the rules on fiscal deficits. These days, the most important rule on fiscal deficits is that they must be under 3pc. Because, well, that's the rule. And our Minister for Finance, Michael Noonan, would rather streak naked down Grafton Street on Christmas Eve than be caught breaking the rule on fiscal deficits. The whole Irish Water debacle is a result of the need to create a semi-private company, so it can borrow "off the books", so it's technically not state debt. That way, the fiscal deficit rule isn't breached. The fiscal deficit rule is also the basis for the disastrous austerity policies. The rigid fiscal deficit rule is economic nonsense, but it's a treasured part of the right-wing economic catechism. If anyone breaks the fiscal deficit rule, the Financial Penalty Squad go to work, jabbing punitively at their calculators, to calculate your fine. Well, anyone except the French. The French broke the rule some while back and the Financial Penalty Squad looked at them and said, "Ah, you're alright." Anyone else breaks the rule, and the Financial Penalty Squad will immediately . . .
Well, anyone except the Germans. But, that goes without saying. 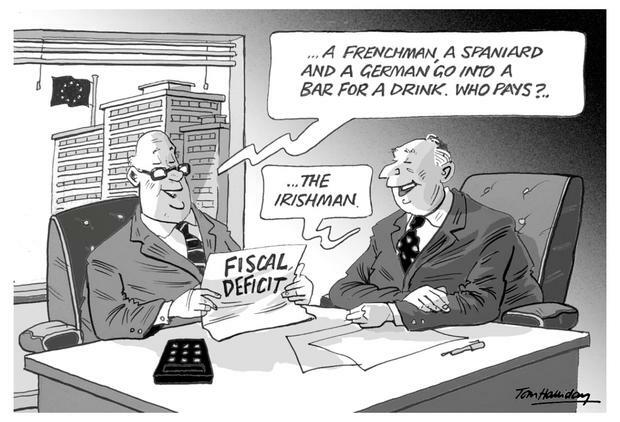 So, when the Spaniards broke the rule on their fiscal deficit, there were gasps right across Europe. Calculators overheated as the Financial Penalty Squad laboured long into the night. They finally concluded that the appropriate fine should equal 0.2pc of Spanish GDP. Which, according to the overheating calculators of the Penalty Squad, worked out at no less than €2bn. At which point the Spaniards leaned forward, looked the EU dead in the eye and growled: "Exceptional economic circumstances." That's Spanish for "Bugger off, senor". The EU blinked. And, last week, the invoice from the Financial Penalty Squad arrived in Madrid. It was a demand for payment of a fine of €0. They actually did that. We demand you pay us zero euros. Or else. I like to imagine the Spaniards keeping straight faces as they solemnly wrote a cheque for that amount and formally presented it to the EU. Some years ago, when the European Central Bank was overcharging us interest on the "bailout", the Spaniards demanded a cut in their interest rate. They got it, and the cut had to apply to us, too. Immediately, our government let it be known that they had "negotiated" a cut in interest rates. Enda began chewing gum and walking with a swagger. Everyone understood that his government had no more negotiated a deal than I had. Fianna Fail was in its keep-the-head-down phase. No one else in politics matters to the media, so they giggled privately, then publicly pretended to believe Enda. And his people have ever since continued telling us about his negotiating skills. Now, the Spanish did nothing remarkable. It's called fighting your corner. Making a fetish of the fiscal deficit risked further damaging the economy, it hurts people, so they did what they had to do: don't muck us about. Our government follows a different strategy: deference. There are three areas in which the policy of national submissiveness is followed. First, the EU, where the strategy is to demonstrate that we will do what we're told, to the letter. We ended up taking on a massively disproportionate share of European bank debt - not alone did the government not demand debt relief, it didn't even raise the issue. Michael Noonan called it "taking one for the team". The strategy was to remind the EU of how obedient we've been, and hope we got a break. It didn't work. If you make a doormat of yourself, you get walked on. Second, the policy of subservience applies in dealing with global giants, such as Apple and Google. We make it clear that we will provide whatever services our clients require to enable them to deprive their home states of tax revenue. Anything they want, we'll bend over. And, in the morning, before they leave, our clients will discreetly leave some cash on the dressing table. Third, our government will politically protect the wealthiest and the strongest in their struggle to enhance their wealth at the expense of the poor and the weak. They will do this at home and abroad. This was most strikingly illustrated at the United Nations, where we stalwartly defended vulture funds - as this column pointed out when it happened in September 2014. We were asked to stand with Peru, Bolivia and India, who wished to limit the freedom of vulture funds, to reduce their ability to wreak economic havoc in pursuit of profit. We chose instead to vote to protect them. So, whether it's the EU, global corporations or vulture capitalists, we do as we're told, and hope it pays off. This isn't just how things have worked out, this is policy. We kiss up, and kick down. How's it paying off, this policy of deference? Well, that depends on who you are. If you're an obnoxious gobdaw who doesn't care who gets hurt as long as you get rich, well - you're doing ok. Reports from Credit Suisse and Knight Frank indicate an increase in the number of millionaires, and a swelling of the wealth of existing millionaires. More than half the houses sold today are paid for in cash. This comes from the spare change of wealthy individuals, also from Irish investors - and increasingly from international investors, our old friends the vulture funds. So, government policies have worked well for the wealthy. How are the rest of us doing? Figures produced at the TUC last week show that our friends the Spaniards haven't been doing too well on the wages front - a mere 2.8pc increase since the recession. France managed a 10.5pc increase and Germany 13.9pc. No one has done better than Poland, a 23pc increase. Ireland? We got a 1.6pc increase. At the same time that wealth is bubbling up for the thin layer at the top, the League of Credit Unions reports that one in 10 parents has to cut back on food in order to meet the cost of sending their kids to school. Soup kitchens are needed more than ever, homelessness increases and is likely to do so into the distant future. But - hey, y'know, we took one for the team. Meanwhile, in the Dail, Mick Wallace and Stephen Donnelly have been trying to winkle out more info on the activities of vulture funds. We have yet to understand the extent to which our lives are being shaped by the forces of greed. But, sure, not to worry. In May, Michael Noonan told the Dail that it's a compliment to be labelled a vulture. Because, "vultures provide a very good service in the ecology through cleaning up dead animals that are littered across the landscape". Ok, so the rich guys are the vultures. Who gets to play the dead bodies whose bones are being picked clean?